The cell culture sampling devices are primarily used in biopharmaceutical industry and for research and development activities. The primary function of cell culture sampling device is to generate a suitable condition in which microorganism can grow and can produce a target product. In cell culture development, prokaryotic or eukaryotic cell is developed in specific conditions. Various benefits associated with cell culture sampling devices are less chance of contamination, system flexibility and decrease in cleaning step. These factors are anticipated to further augment the growth of cell culture sampling devices market across the globe. The global cell culture sampling device market is anticipated to witness significant CAGR during the predicted period. The growth of the global cell culture sampling device market is primarily supported by the rising number of regulatory norms which is approving the use of cell culture-based vaccines, rising demand for monoclonal antibodies, global funding for cell-based research, growing inclination for single-use technologies and the launch of advanced cell culture products. The global cell culture sampling device market is segmented on the basis of devices and application. On the basis of application, cell culture sampling device market is further sub-segmented into drug development, gene therapy, cancer research and biopharmaceuticals. The biopharmaceuticals is anticipated to be fastest growing segment on the account of expansion of major pharmaceutical companies, rising government authorizations for the production of cell culture-based vaccine and increase in demand for monoclonal antibodies. Robust growth in biopharmaceutical industry and bioprocessing industry are the main driving factor for the cell culture sampling devices market. High research & development activities by various research organizations are also expected to upsurge the demand for cell culture sampling devices during forecast period. Companies operating in the global cell culture sampling devices are focused towards adopting strategies such as developing new products and collaboration in order to establish its foothold across the globe. Furthermore, the advancement in technologies in order to develop culture tissue from cells, methods of proteomic surgical therapies and genomes modification. 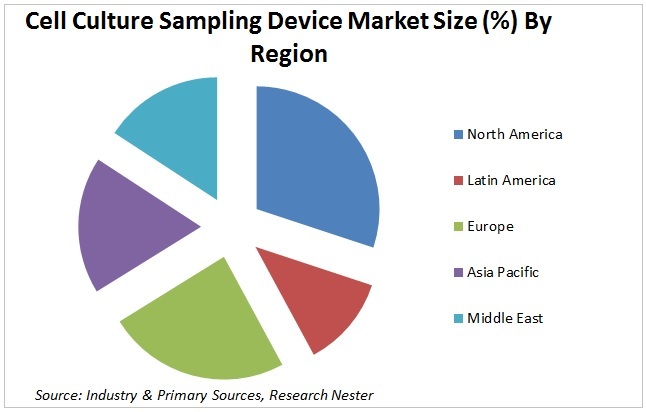 The growing demand for cell culture sampling device on the account of high application in gene therapy and cancer research is also anticipated to significantly drive the demand for cell culture sampling device market during the predicted period. However, high maintenance of the cell culture sampling devices and huge initial investment in order to establish cells culture research laboratories are the major factors anticipated to hinder the cell culture sampling devices market globally.